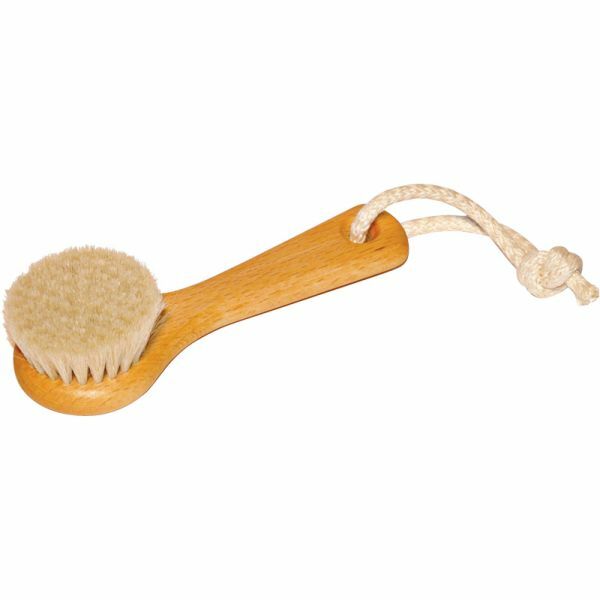 Plastic free facebrush. Made from locally grown beech wood and pure natural soft goats hair. Does not come with the cotton string. Facial Brush. Delight your body with a brush massage - either as dry massage or in a warm bath. A reviving feeling for body and mind - sheer wellness. Soft exfoliation, encouraging blood flow. Plastic free brush. Made from locally grown beech wood and pure natural soft goats hair. The beech wood is FSC certified in accordance with the strict guidelines of the Forest Stewardship Council. All materials are of the highest quality. Responsibly made in Germany. Measuring - 128 x 42 mm. Does not come with the cotton string. In order for you to enjoy your hair brush for a long time to come, we recommend that you clean it and care for it regularly. First of all, free your brush from loose hair. After that, the brush should be washed in lukewarm water to which a touch of shampoo/shampoo bar can be added. To this end, dip only the bristles in water and move the brush back and forth. Please take care to ensure that the brush body does not get too wet. After this, rinse the brush well in clear water and then place it on a cloth, for example, for drying. The bristles should point down during the drying process. Never leave a brush to dry near a radiator - normal room temperature is ideal.